St. Giles' Cathedral is one of the most beautiful cathedral's I've ever visited. Not only is it imposing and stunningly grand, but full of rich, religious history. The exterior of St. Giles'. The current building dates from the 14th century and it was remodeled during the 19th century. Much of the building was altered during the Reformation and John Knox's tenure as minister. The nearly 50 side aisles were removed, as were the ancient relics belonging to St. Giles', the church's patron saint. Knox is buried behind the church in what is now a car park. A stone in the pavement, at place number 23, marks the location of his grave. The Cathedral stood tall during the Bishop Wars, The English Civil War, and the Wars of the Three Kingdoms, long-sufferingly tolerated a merger into the Church of Great Britain in 1707, was divided into smaller kirks, until finally in 1829 was restored to an open and beautiful condition. The goal was to make this cathedral the the "Westminster Abbey for Scotland". In 1911, the small side chapel, the Thistle Chapel was build to accommodate the Scottish Order of the Thistle, Scotland's order of chivalry founded by James VII in 1687. The previous chapel, located at Holyrood Palace was destroyed when the heavy roof caved in. The Thistle chapel features incredibly stunning woodwork and seats for each knight belonging to the order of the Thistle. The center seat belongs to the ruler of Great Britain and the four seats on either side belong to Prince Charles, Princess Anne, Prince Phillip and Prince William. 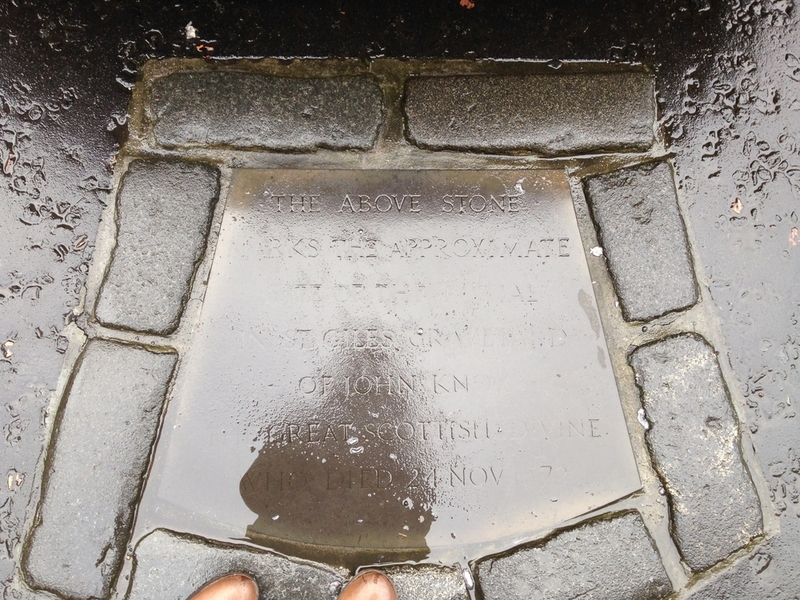 A stone in the center of the floor is in remembrance of Queen Elizabeth's father, George VI. The guide in the chapel informed us that if Prince Charles is a "good boy he'll do the same for his mum". The stone floor comes from Aisla Craig, a small granite island known for it's blue granite used mainly to make curling stones. Small green squares of marble decorate the edges, and that rare substance comes from the Isle of Iona. Above each seat is an elaborate carving topped with a symbol of the knight. Upon each knights' death the symbol is taken down and given to the family and a new knight is awarded a place in the Order of the Thistle. The most recent knights were given their places in 2014. The body of James Graham, 1st Marquess of Montrose is buried here, after his execution for his stand with the Covenanters. His heart, which was taken from his body after he was drawn, quartered, and beheaded, became a family treasure until it was lost during the French Revolution. His sworn enemy,, Archibald Campbell, 1st Marquess of Argyll has a memorial directly across the church. The many stained glass windows were added to the cathedral in the 19th century and most of them displays Bible stories. The church is brighter by comparison than St. Mungo's in Glasgow but it is still relatively dark so I was not able to get pictures of the signed National Covenant of 1638, nor was I able to snap a decent picture of the memorial to Robert Louis Stevenson. The inner walls are covered with memorials and plaques, most for the Great War, although my personal favorite was the memorial thanking God for James Young Simpsons' discovery of chloroform in 1847. The church is still in use today and many worshippers can be seen in various chapels, lighting candles, praying or in quiet meditation. Additionally, it is used for organ recitals as the organ and acoustics are astonishing. Since it is a church admission is free but if you wish to take pictures there is a £2 fee.